If the motion of the aether be such that udx + vdy -\-*wdz is an exafct differential for one system of rectangular axes, it is easy to prove, by the transformation of co-ordinates, that it is an exact differential for any other system. Hence the formulae (6.) will hold good, not merely for light propagated in the direction first considered, but for light propagated in any direction, the direction of ♦propagation being taken in each case for the axis of ss. 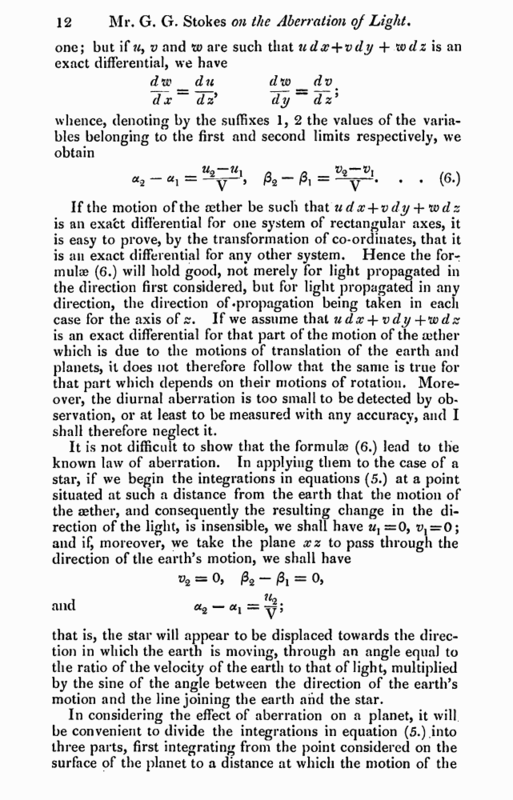 If we assume that u dx + v dy + w dz is an exact differential for that part of the motion of the aether which is due to the motions of translation of the earth and planets, it does not therefore follow that the same is true for that part which depends on their motions of rotation. Moreover, the diurnal aberration is too small to be detected by observation, or at least to be measured with any accuracy, and I shall therefore neglect it. 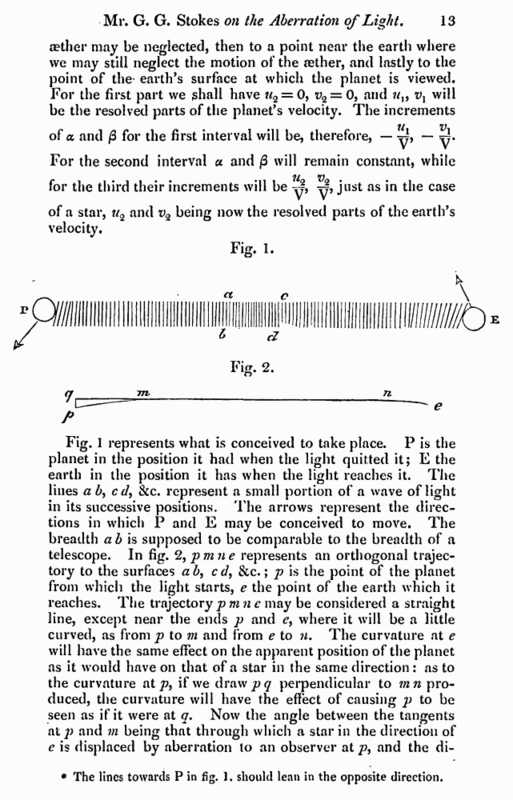 that is, the star will appear to be displaced towards the direction in which the earth is moving, through an angle equal to the ratio of the velocity of the earth to that of light, multiplied by the sine of the angle between the direction of the earth’s motion and the line joining the earth and the star. of a and /3 for the first interval will be, therefore, — y, — ^. of a star, w2 and i>2 being now the resolved parts of the earth’s velocity. The lines towards P in fig. 1. should lean in the opposite direction.